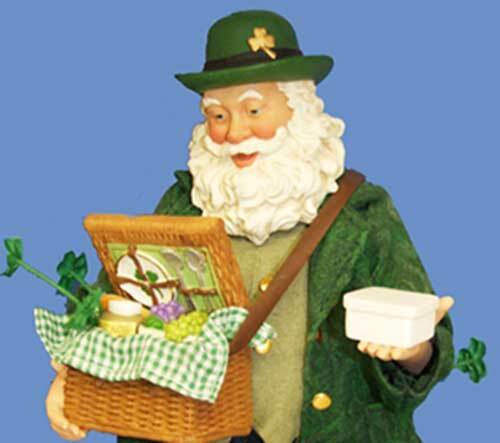 Irish Santa features a picnic basket along with a green coat and derby with a shamrock. This Irish Santa is made by Kurt S. Adler. 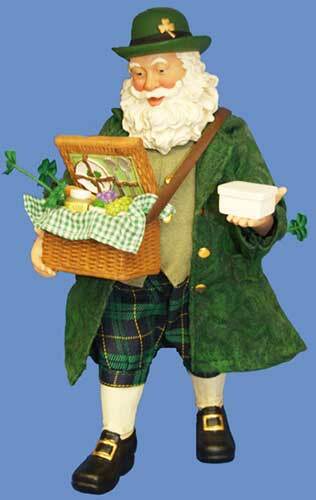 This Irish Santa figurine is named Picnic in the Park and he features a basket of goodies along with his ubiquitous shamrocks. The Irish Santa stands 10 1/2" tall and is made of porcelain and Fabriché by KSA. The Irish Santa decoration is gift boxed with a shamrock history card, complements of The Irish Gift House. Irish Santa is a musical figurine that plays When Irish Eyes are Smiling. Irish Santa has found his pot of gold at the end of the rainbow. This Irish Santa is holding a large shamrock with a special message.